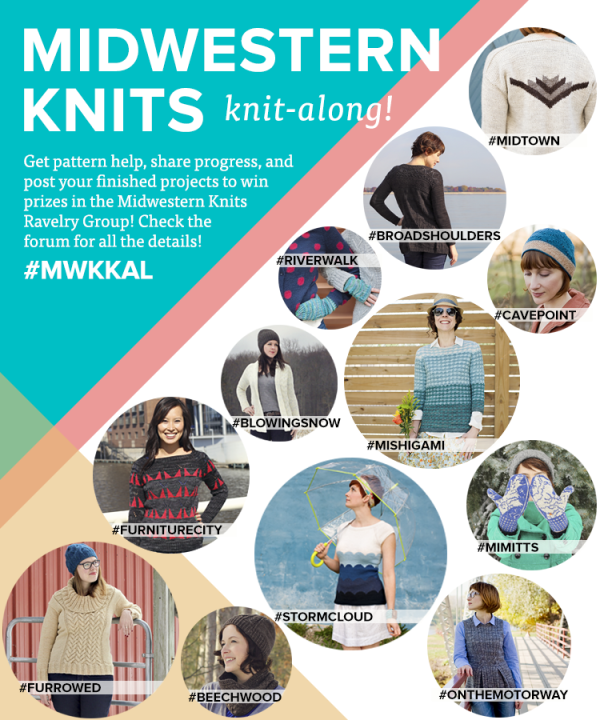 Join us in the Midwestern Knits Ravelry Group this fall where we’ll have a knit along for every single pattern in the book. You’ll have a chance to talk to the designers, get support for your project, and win prizes along the way. Learn more about each design straight from the source! Aug 27 5:30-8:30pm: Knit1 in Chicago, IL – with Allyson & Carina! Oct 4: Fibre Space in Alexandria, VA – with Ann Weaver! Oct 11, 2-4pm: String Theory in Glen Ellyn, IL – with Allyson! Oct 22, 3:30-8pm: Country Needleworks in Jenison, MI – with Allyson & Ann Weaver! Nov 6, 6-9pm: Windy Knitty in Chicago, IL – with Allyson! Nov 21, 1-3pm: Mosaic Yarn Studio in Mt Prospect IL – with Allyson! WOULD YOU LIKE TO HOST OUR TRUNK SHOW AT YOUR SHOP? We’d love to have you! Drop a note to Allyson and she’ll get you set up on our Trunk Show Tour.